Sen. Ken Horn has lived in Saginaw County for over 30 years. He currently lives in Frankenmuth with his wife Veronica. They have two children, Kevin and Andrea. Kevin and his wife Ruth also live in Frankenmuth and have blessed “Oma and Opa” with two beautiful grandchildren; Liam and their angel Zellie, who is terribly missed. Andrea and her husband Anton currently reside in Portland, Oregon. Ken graduated from Concordia University with a Bachelor of Arts Degree in Criminal Justice. He was a small business owner for nearly 15 years, owning and operating Horn’s Restaurant in his hometown of Frankenmuth. He has also served as a substitute teacher in Bridgeport and Frankenmuth schools. In 2004, he accepted the position of vice president of donor services at the Saginaw Community Foundation where he managed over 300 funds and oversaw nearly $1.2 million in grant programs that helped improve Saginaw County. Ken began his political career as a Saginaw County Commissioner. For 16 years, he represented Birch Run, Bridgeport and Frankenmuth Townships and the city of Frankenmuth. 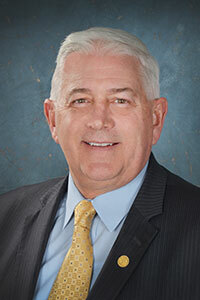 He served as chairman of the legislative sub-committee and also served on courts and public safety, the Community Corrections Advisory Board, the Saginaw County Airport Commission, and the Saginaw County Event Center Board. In 2006, Ken was elected to serve the 94th District in the Michigan House of Representatives. From 2007 to 2012 he represented the cities of Birch Run, Chesaning, Frankenmuth and St. Charles in addition to 12 townships in Saginaw County. He served as chairman of the House Energy and Technology Committee. In 2014, Ken was elected to serve the 32nd District in the Michigan Senate. He represents all of Saginaw County and the western portion of Genesee County. He currently chairs the Senate Economic and Small Business Development Committee, along with two Senate Appropriations Subcommittees: Capital Outlay and Talent and Economic Development/MEDC. The senator has been an activist and leader in Saginaw County for decades through his volunteer work with area organizations including Frankenmuth Rotary International, Saginaw Art Museum, Habitat for Humanity, Saginaw Field and Stream, Frankenmuth Conservation Club and many local chambers of commerce. Additionally, he completed Michigan State University’s Political Leadership Program, Leadership Saginaw County, the Saginaw County Vision 2020 One Thousand Leaders Initiative, received a fellowship from the Council of State Governments to the Bowhay Institute for Legislative Leadership Development, and graduated from the Henry Toll Fellowship Program.